On the menu today is a recipe that I found several years ago in one of my many Taste of Home Annual Cookbooks. Slow Cooker Broccoli became a fast family favorite. The first time I made this recipe I was looking for a vegetable dish that I could serve with our Thanksgiving Dinner, one that preferably didn’t take up anymore room in my already over crowded oven. When I saw this recipe, it sort of jumped out at me. This recipe for Slow Cooker Broccoli is made with frozen chopped broccoli, one can of cream of celery soup, shredded sharp cheddar cheese, chopped onion, Worcestershire sauce and buttery-crackers. Sounds good doesn’t it. This recipe is not only super delicious, its fast and easy. Everything goes into a slow cooker and baked for 2 1/2 to 3 hours. Perfect to serve for Thanksgiving or for any dinner when a tasty vegetable will be much appreciated. After it’s debut a few years ago, this delicious slow cooker broccoli bake recipe makes an appearance on our Thanksgiving table each and every year. It has definitely become one of our all-thyme favorite recipes from Taste of Home. I consider this recipe a Taste of Home classic recipe. Here are two other recipes you might want to try, one is made in the slow-cooker and the other in the oven. Slow Cooker Oxtail Stew and Mini Meatloaves and Gingered Carrots. This recipe became a fast, family favorite and it will become your family's too. In a lightly greased crock pot combine; broccoli, soup, 1 cup cheese, onion, Worcestershire sauce and pepper. Sprinkle crackers on top; dot with butter. Cover and cook on high for 2-1/2 to 3 hours. Cook 10 minutes longer or until cheese is melted. This recipe also became a fast, family favorite. It’s probably the most requested ‘vegetable’ recipe that we have in our Recipe Box. 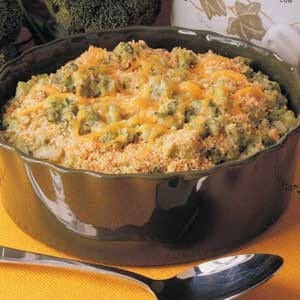 Give it a try and see what your family thinks, Vegetable Casserole for a Crowd. This holiday season rethink your vegetables and try something new or try a vegetable dish in addition too the holiday classic, green bean casserole.